2015 Yamaha SX192 High Output -- Brand New! -- Full Warranty! -- $2800 off! Brand New Yamaha RED SX 192 SHO on BLOWOUT SALE! OVER $2800 off Retail Price! 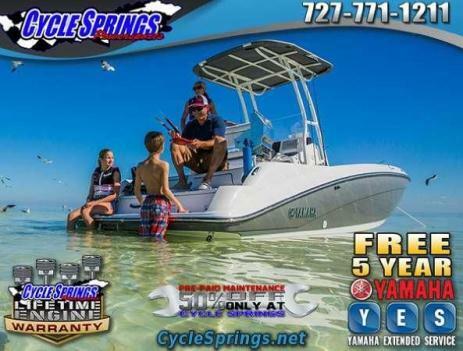 Includes Custom Trailer and Shipping cover WE HAVE OTHER YAMAHA BOATS IN STOCK AS WELL! Luxury and Performance and Power! The top pick for families who want big power and the best feature-to-value ratio in the industry. The supercharged 1.8 liter Super High Output Yamaha Marine engine is fuel-efficient and easy to maintain. The spacious interior features all-new upholstery upgrades and convenient storage compartments. Key features include a two-tiered swim platform, Bimini™ top and trailer at no extra cost.HighlightsEngine: Quick out of the hole, Yamaha's reliable, supercharged 1.8 liter Super High Output Marine engine delivers smooth performance while packing a lively punch.Stereo: Clarion® stereo system with built in Bluetooth streaming and easy smartphone and tablet compatibility.Speakers: Premium Polk® speakers are abundant throughout the cabin.Carpet: Snap-in marine-grade teak-style carpet comes standard.Bimini: A standard feature, the adjustable Bimini™ top provides optimum shade.Swim Platform: A popular gathering spot with easy access to the water, two-tiered swim platform features backrest cushions, a wet storage compartment and slip-resistant Hydro-Turf mats.SpecificationsLength: 19 ft. 2 in.Weight: 2150 lb.Beam: 8 ft.Draft: 14 in.Dead Rise: 18°Seating Capacity/Weight Capacity: 1240 lb. (8 persons)Premium Teak-Style Marine-Grade Carpet: StandardIntegrated Drink Holders: Nine, stainless steelAdjustable Captain's Chair with Flip-up Bolster: StandardPassenger-side Captain's Chair: StandardU-Shaped Cockpit Seating: StandardGlove Box: StandardStorage Capacity: 417.4 gal.Tilt Steering: StandardCourtesy Deck Lighting: StandardDedicated Anchor and Rope Locker: StandardSternIntegrated Swim Platform: StandardUpholstered Cushioned Backrests: StandardStainless Steel Telescopic Reboarding Ladder: StandardHydro-Turf® Mats: StandardStern (Wet) Storage: StandardTechnicalClarion® Marine Stereo: StandardWireless Stereo Remote: StandardBluetooth® Capability: StandardUSB Input: StandardMarine Speakers: FourNo Wake Mode™ Control: 3 positionCruise Assist: StandardElectronic Speedometer: StandardFuel Management System: StandardCockpit Drainage System (CDS): StandardIn-Water Height (Bridge Clearance): 3 ft. 5 in.Engines & DrivelineYamaha Marine Engine: Single 1.8 Liter SUPER HIGH OUTPUTDisplacement (per engine): 1812ccFuel Capacity: 30 gal.Electronic Fuel Injection: Standard155MM High-Pressure Pumps: StandardPump Clean-out Ports: SingleOil Capacity per Engine: 1.1 gal.Impeller: 3-blade, stainless steelExteriorAvailable Color(s): Maple Red or Suede GrayStainless Steel Bow Rails: StandardStainless Steel Cleats (6): Pop-upTow Hook: StandardBimini Top: StandardShipping Cover: StandardTrailerPainted Trailer with Swing-away Tongue: Single AxleGalvanized Trailer with Swing-away Tongue: Optional (Single Axle)Disk Brakes: StandardLights: StandardSafety Chains: StandardAdjustable Winch Stand with Strap and Hook: StandardHeight on Trailer: 7 ft. 1 in.Length on Trailer: 22 ft.Length on Trailer with Tongue Folded: 20 ft. 1 in.Dry Weight on Painted Trailer: 2923 lb.We want to ensure that you will have the best possible experience shopping with us. Please be sure you are fully aware of all stipulations of purchase before bidding. I'm a really nice guy and very eager to help, please feel free to reach out with any questions you may have! Please take note of message below! MUST ADD $1,999 water-ready prep fee to final auction price!!! eBay Buy-it-Now or final winning auction bids DO NOT include all dealer fees and taxes UNLESS INDICATED!!! All powersports and marine products are subject to $125 dealer services fee. Prep fees may also apply to new products. PLEASE CONTACT John at 314-378-0449 before bidding with any questions on total price. Thank you for shopping with Surdyke Yamaha. We have been in business for over 40 years and have serviced and sold more power sports customers than any dealer in the Midwest. Here at Surdyke Yamaha "You ride on our reputation" is not only our company slogan but the foundation we hold strong to. Whether on the water, the road or the dirt . . . if it has wheels or floats we sell it and ride it!!! Our Surdyke Family is the #1 Yamaha dealer in the mid-west not because we make customers but because we make friends!! Naturally we do not collect sales tax. Our standard administrative fee of $125.00 will be added to the price. We gladly accept trade-ins or will purchase your unit outright. Financing is available with approved credit. While we strive to provide correct and up to date information in all of our listings, factory photos and online specs are often used in our listings and occasional errors do occur. Prices, specials and availability are subject to change. We encourage you to view and demo your unit in person before purchasing. Be sure to mention that you saw it on E-BAY to get this Lowest possible price!We don't sell them for this cheap in our store! TermsPlacing a Bid: Your bid constitutes a legally binding contract to purchase this vehicle. Please do not bid if you're not seriously interested or financially able to purchase this vehicle.Surdyke Yamaha reserves the right to,Obtain and verify the registered information of all users who bid on this auction.Cancel any and all bids at our discretion, or end the auction early if necessary.Bidders Age: You must be 18 years of age or older to Bid.Special eBay Bid Retraction Rules:If you place a bid before the last 12-hour period of the auction:You may retract that bid before that last 12-hour period but only for exceptional circumstances. You will not be allowed to retract that bid during the last 12-hour period of the auction.If you place a bid during the last 12-hour period of the auction:You will be allowed to retract the bid for exceptional circumstances but only if you do so within one hour after placing the bid.Funds & Financing:For help in arranging for a Pre-Approved loan or for any questions please email or phone John at 314-378-0449 prior to bidding.Buyers Inspection: Surdyke Yamaha - Osage Beach, MO has done our best to disclose all information known about this vehicle for auction. We Welcome a buyers inspection. If you plan to have a buyers inspection, please make sure you inspect the vehicle prior to the auction ending. Inspection fees if any are Buyers responsibility.Representations and Warranties made by seller: This vehicle is being sold "as is". Manufacturer's warranties may still apply. Extended warranty may be available, No representations or warranties are made by seller, nor are any representations or warranties relied upon by bidders in making bids.Taxes and Registration fees: Out of state buyers are responsible for all state, county, city taxes and fees, as well as title service fees in the state that the vehicle will be registered. All taxes and fees must be paid in full in order for vehicle to be titled and registered.Title Information: Vehicles titles may be held by banks or lenders as collateral for loans. In many cases there is a delay in receiving the original instruments up to 21 days from the time we pay a vehicle off. While we usually have all titles in our possession at closing, there are occasions where we may be waiting for them to arrive. If payment is made by cashier's or personal checks we will hold all titles for 10 days or until funds have cleared.Shipping & Delivery:All shipping charges are the buyer's responsibility. uship.com is an excellent resource and we will help with shipping arrangements but will not be responsible in any way for claims arising from shipping damage!Licensed Carriers are generally insured for $3,000,000.00. We assume no responsibility for damages incurred after the vehicle leaves our showroom. We are not affiliated with any carrier. Any claims or other communication regarding shipment of vehicles will be between you and the shipper, not with Surdyke Yamaha of Osage Beach, MO.The amount of time it takes for delivery is dependent on the carrier, but is generally 7-14 days from the date the vehicle is picked up from our facility until it is delivered to your destination. Verify with the shipper for an Estimate Time of Arrival to be sure.Finalizing your Purchase:Surdyke Yamaha - Osage Beach, MO will contact the successful high bidder by e-mail after the auction closes.Successful high bidder MUST communicate with Drew or John at Surdyke Yamaha of Osage Beach, MO by email or phone (314) 378-0449 within 24 hours of the auction ending to make arrangements to complete their transaction. If we cannot confirm your intention to buy or the sale is not completed within 5 days, we reserve the right to relist this vehicle or sell to any other qualified buyer.In order to secure bid on vehicle, Successful bidder (BUYER) must within 24 hours of bid closing send to Seller a Deposit in the amount of $1000.00 by major credit card, cash in person or bank certified funds. Within 72 hours of bid closing, Buyer must send balance of funds by bank wire transfer, cash in person, bank certified funds, or arrange financing through our dealership.At time of sending initial deposit, Buyer MUST fax copy of their State issued valid Driver License. Furthermore, before said vehicle is released for shipment to Buyer, all other Sale related and title related paperwork must be signed and returned complete to Seller. Tousley Motorsports 1400 E County Road E St. Paul, MN 55110 Phone: 1-877-730-9267 2005 Sea-Doo Speedster 200 (310 HP) Description: IF YOU CALL OR VISIT OUR STORE PLEASE ASK FOR DEREK OR EBAY!!! Up for sale is a used 2005 Sea-Doo Speedster 200 with twin 155 Horse 4-Tec engines for 310 Total HP. This is SOLD AS IS and can be shipped to most major U.S. cities from $699 to $1199 and most major Canadian cities from $999 to $1,599. Please call and ask for Josh with any questions @ 1-877-730-9267. See terms below! This Speedster is in good condition and everything is in working order. There's plenty of time left this summer to get out on the water and have some fun. With 310 Horse power this will do most everything you want on the water. From pulling skiers and tubers to just ripping around on the water. This does have a cover and stereo system along with a fire extinguisher. The trailer does come with the boat and it's ready to haul to the cabin. On-board Storage2. Grab Handles3. Multi-Function Aluminum Rails4. Built-in Ice Chest5. Windscreen w/Pop-up WindDeflector and Helm Storage6. Clarion AM/FM CD Stereo w/4 speakers7. 12 Volt Jack8. Ski Storage9. Cockpit Courtesy Lights10. Ski Pylon11. Sun Deck Pad12. Dual Rear Storage Compartment13. Swim Platform w/LadderENGINEType/displacement horsepower……6 Cylinder/2,988 cc, 310 hp(3 Cylinder/1,494 cc, 155 hp per engine) (3 Cylinder/1,494 cc, 185 hp per engine)Fuel system……MPI fuel injectionLubrication……Dry sump oil systemExhaust……Dual mufflersEngine protection systems......Overheat warning device, RPM limiter,low oil, low voltage, check engineMax RPM……155 hp, 7,300 Corrosion protection……Closed loop engine cooling systemDRIVE UNITJet pump type......Axial flow, single-stageDirectional gate......High-thrust, reverse gate, F/N/RImpeller......Stainless steel, progressive pitchIntake grate......Inlet Clearance SystemELECTRICALStarter......Electric with D.E.S.S. (Digitally Encoded Security System)Generator......30 Amp/380 WBattery......12 voltMECHANICAL......Main battery cutoff switchANALOG GAUGES......Speedometer backlit......Tachometer backlit (2X)......Fuel/oil gauge backlit......Warning backlit CAPTIONS1. Available in Viper Redand Mazatlan Blue2. Full instrumentation dash3. Lockable dual accessrear storage area4. 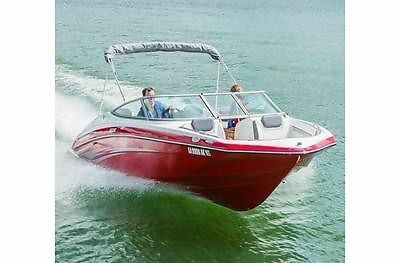 Optional wakeboard towerDIMENSIONSOverall length......19'9"/6.02 mBeam......8.0"/2.44 mDraft......12"/30.5 cmDeadrise......20°Weight (dry)......2,770 lbs./1,256 kgPassenger capacity......7 personLoad limit......1400 lbs./635 kgStorage capacity......46 cu.ft/1.30 cu.mFuel capacity......40 US gal/151 LOil capacity......3.5 L per engineEngine (options)...... Twin 155 hp Rotax™ 4-TEC™ 4-Stroke......Twin 185 hp Rotax™ 4-TEC™ 4-StrokeDIMENSIONS (ON TRAILER)Length……23'5"/7.14 mWidth……8'6"/2.59 mHeight (no tower)……6'6"/1.98 mHeight (tower down)……7'1"/2.16 mHeight (tower up)……9'11"/3.02 mADDITIONAL SAFETY &CONVENIENCE FEATURES• One-Touch Inlet Clearance System• Padded/Bolstered Seating• Six Stainless Steel Cleats• Stainless Steel Eyes Bow and Stern• Driver/Passenger Console• Glove Compartment• Trailer, Custom-Matched (Galvanized Opt. )• Full Instrumentation • Non-Skid Decking• 12 Volt Jack • Non-Slip Grab Handles• Navigational Lights • Horn (Flush Mount)• Bimini Top (Opt.) • Cockpit Carpet (Opt. )• Auto Bilge Pump/Switch More information about TOUSLEYMOTORSPORTS and our accessories. Click here--> To Visit Tousley's Ebay Store Click Here ----> Terms Of Sale: If you are the WINNER of this auction you must contact us with your information within 48 hours. There will be a $20 transit tax (trailer) and a $75 Documentation fee that will be added to the final price of this vehicle *( see below for delivery options) Tousley Motorsports will be responsible for set-up preparation and delivery obligations on new vehicles as prescribed by the manufacturer. This item is currently available on our show floor. Please call for availability prior to purchasing online. Used vehicles are sold as is with no warranty, unless stated in the listing. For credit card purchases over $1000 and finance options please call 1-877-730-9267 for authorization. Tousley Motorsports does NOT collect sales tax or license on units that we deliver to an out of state residence. If the unit is picked up at the store you will pay Minnesota sales tax (6.5% on trailer and 7.125% boat), Unless it is a licensed vehicle. (motorcycle, scooter, or trailer) if you are a Minnesota resident we will collect tax and license. (WI is different as we can license in that state. Please call with questions) Please do NOT bid if you need permission or if you have any other questions on the item. If the above terms are not met Tousley Motorsports reserves the right to relist the item. For more information about this vehicle and its options. Please call Derek at 1-877-730-9267 *VERY IMPORTANT PLEASE READ* Additional forms of payments include. Direct deposit. Bank to Bank Wire Transfers Credit Cards (Visa,Mastercard,Discover) Call for authorization for purchases over $1000.00 Finance options available. This vehicle may also be available for purchase on our show floor. Auction may be ended at any time for any reason by Tousley Motorsports. Vehicle Pickup Options: Please call Derek @ 1-877-730-9267 for pick up..... About Us: We are the largest Motorsports dealer in the upper Midwest, and have been in business for 40 years, with Over 1000 New and Used units in stock. We offer most major brands. Please see our ABOUT ME page for more details. Our State of the art 60,000 Square foot facility is home to over one million dollars of Parts and Accessories. We have been Sellin' Fun Since 71! We stand behind our product. Any questions please e-mail. Minnesota sales tax will apply to MN residents. Bid with confidence as we have shown that we are here to provide a great service.